One of the first things you should do when you are facing foreclosure is make sure you understand how the foreclosure process works. Understanding the foreclosure process is crucial to preventing foreclosure. Before the foreclosure process even begins, there are things you can do to prevent it. 1.) The first thing you can do is try to obtain a loan modification, reinstatement, forbearance, and-or principal reduction and have a chance to stay in your home. 2.) The second thing you can do is request a foreclosure alternative like a short sale, or deed-in lieu of foreclosure (DIL). In these solutions, the property being returned to the lender. In many instances, these foreclosure alternatives include offers cash for keys, lease back, deficiency relief, and more. Foreclosures come in two types: judicial and non-judicial. Check the foreclosure process in your state! A judicial foreclosure is a process wherein your lender must use the court system to seize your home. This makes foreclosure more expensive for your lender, and can typically take much longer to complete. These days, with all of the issues involving mortgage fraud and loan origination violations, having an experienced foreclosure defense attorney is essential. A non-judicial foreclosure, on the other hand, is based on the state’s statutory requirements. In this foreclosure process, lenders don’t have to go through the court system to foreclose on your home. This kind of foreclosure can take as little as two months. Many non-judicial foreclosure states have recently adopted procedures that require foreclosures to be approved by a judge, in order to protect homeowners’ rights. In these states, it is now even more important than ever to hire a foreclosure defense attorney. In either case, once your lender decides to foreclose, they will record a Notice of Default (NOD) at the county office where your home is located. This usually doesn’t happen until you miss your third payment, but once it does, it progresses fairly quickly. Within 10 days, your lender will publish the NOD in the local newspaper and, within 30 days, you should receive the same notice by mail. Once you have received a notice of default, only a foreclosure defense attorney can effectively protect your interests. The NOD outlines the steps you need to take to resolve the defaulted mortgage. Most lenders give you three months to bring account current. Otherwise, your lender can schedule a sale date and your house can be sold within the next month. Once your home is sold, you have ten days to leave the property. As you can see, time is of the essence when you’re facing foreclosure. This is especially true in states that have non-judicial foreclosure laws. 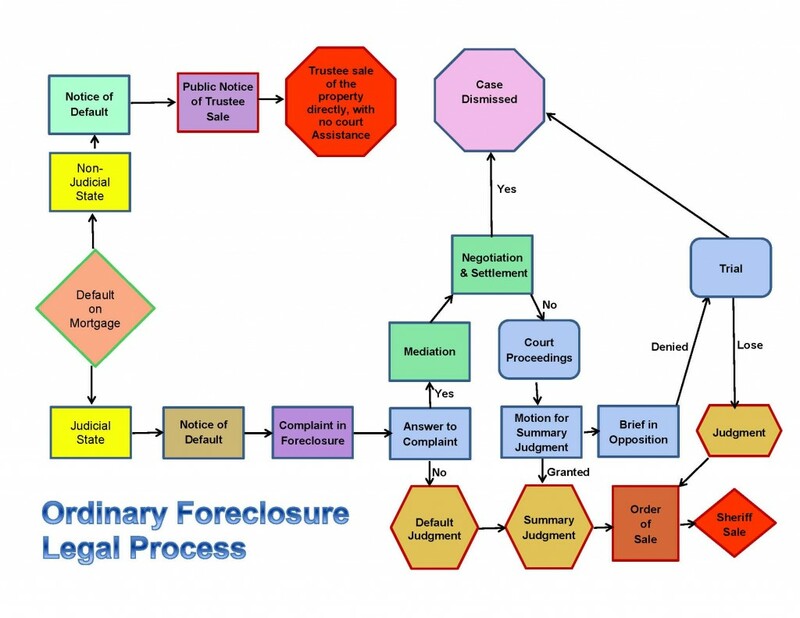 You can see a more detailed description of the foreclosure process in the Foreclosure Timeline. When you fall behind in your mortgage payments, you can expect lenders to react in specific ways at specific times. There are also two distinct foreclosure processes; judicial and non-judicial. While not all lenders use the same process, the following timeline shows a typical foreclosure timeline, from late payment to foreclosure. The Mortgage payment is due on the first of the month, and usually has a 15 day grace period. During this period, your payment is not yet “late”. At this point, a late charge is assessed which is typically 5% of the monthly payment. 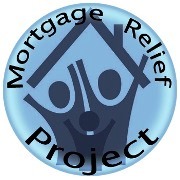 The company that processes the payments (called the mortgage servicer) begins collection activities with attempts to contact with the borrower to find out why the payment is late. This is one of the the best times to request assistance, such as a loan modification. At this point, the new month begins and a payment is due for both the previous month and the current month. Any payment you make will be applied to the previous month’s payment and late fees before being applied to the current month’s payment. During this period, the servicer sends a “demand” or “breach” letter to the borrower explaining that the terms of the mortgage have been violated. The borrower is given 30 days to resolve the delinquency by paying the delinquent amount. The “escalation” clause of the Standard Federal Mortgage is now in effect. The lender/servicer can only accept payment in full of all outstanding mortgage payments, penalties, collection costs, and other legally allowable fees, or forfeit their rights to foreclose on the property. Foreclosure proceedings begin with a Notice of Default (NOD). The document is recorded in the county in which the property is located. The recording of the Notice of Default gives “Constructive Notice” to the public. This is the latest time that a Complaint for Foreclosure will be filed in the court system. In a Judicial State, the homeowner must answer this civil suit, most often by using a foreclosure defense attorney. The defendant then has 28 days to respond or have a default judgment issued by the court against them. (In California, after the recording of the Notice of Default, the borrower and junior lien holders are given proper notification and the borrower has 90 days to bring their account current. This period is referred to as the Reinstatement Period. Notice of Trustee Sale. If the borrower does not reinstate their account within the 90 day period, the lender will authorize and instruct the Trustee to record the Notice of Trustee Sale (NOS). The property is scheduled for sale in as little as 60 days or as long as 300 days from filing. Bidders are required to pay with certified funds. The opening bid starts at two thirds, or 67%, of the sheriffs appraised value of the property. The auctioneer seeks the highest bid; the successful bidder must tender payment at the sale. In some states, there is a redemption period not longer than 30 days. IMPORTANT, PLEASE READ: This timeline represents a typical foreclosure timeline for most mortgages. Each state has its own laws and foreclosure process. For a detailed breakdown of the foreclosure process in your state, consult an experienced foreclosure defense attorney licensed to practice law in your state.